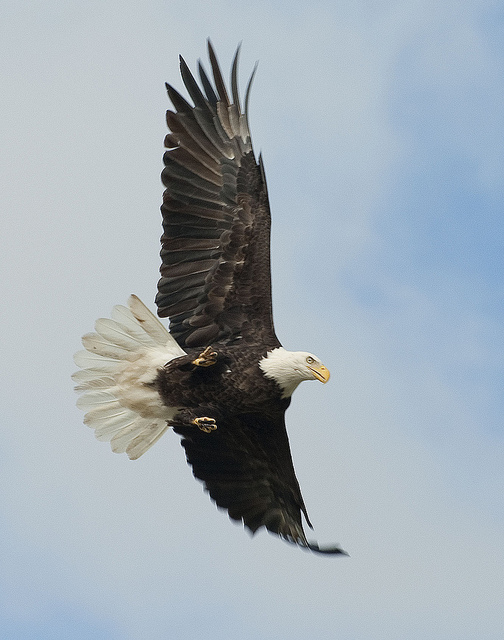 Bald eagle in flight; Photo by Brian Garrett/Flickr (Use Permitted with Attribution/No Derivative Works). In the wild, a bald eagle will live 30-35 years (up to 50 years in captivity). A full-grown bald eagle has a wingspan up to 7 feet. They can fly up to 30 miles an hour and dive at 100 miles an hour! Eagles feed primarily on fish, supplemented by small mammals, waterfowl, and carrion. Eagles mate for life, and an established pair will use the same nest for many years. Over time some nests become enormous; they can reach a diameter of 9 feet and weigh as much as 2 tons! The female lays 2 or 3 eggs and both parents share incubation and guard them diligently against predators (such as squirrels, gulls and ravens). While the chicks are small, the parents move about the nest with their talons balled up into fists to avoid harming them. In 1782 there were between 25,000 and 75,000 birds in the lower 48 states alone. But farmers considered bald eagles vermin and shot them on sight. As people started moving west, much of the nesting territories and food sources of the eagle diminished. By the late 1800's, eagles were becoming very scarce. In 1940 the Bald Eagle Act was passed and eagle populations began to recover. But pesticides were starting to be used extensively about this same time. Plants sprayed with DDT were eaten by small animals, which in turn were eaten by eagles. Both the adult birds and their eggs were affected. The eggshells were too thin to withstand incubation and were crushed (or simply did not hatch). Large quantities of DDT were found in the fatty tissues of dead eagles, and by 1963 their numbers had fallen to a mere 417 nesting pairs. 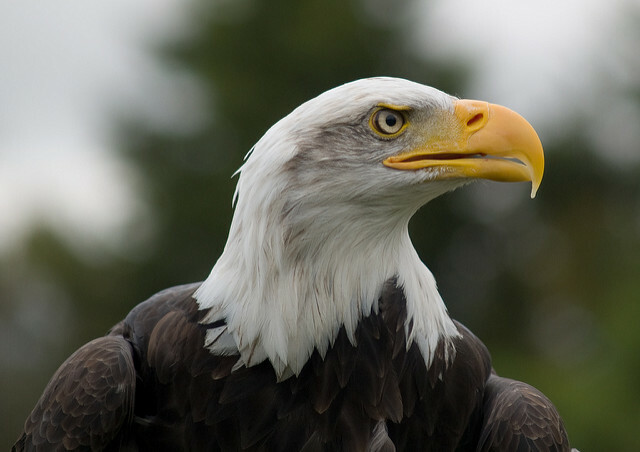 The Endangered Species Acts of 1966 and 1978 helped to protect the bird, but banning of DDT in 1972 was the most effective in the bald eagle's recovery. By the year 2000 the US Fish & Wildlife Service proposed that the eagle be declared fully recovered, and the Department of Interior took the American bald eagle off the Federal List of Endangered and Threatened on June 28, 2007. Bald eagles with eaglet in nest; Photo by Bill Buchanan/USFWS/Flickr (public domain image). Bald eagle head profile; Photo by Ben Bawden/Flickr (noncommercial use permitted with attribution/no derivative works).